The courtyard smelled like the heady mix of candles and soil right after it rains. The drizzle started a few moments after he arrived, and now he wished he’d gotten one of those giant red umbrellas at the entrance. Basilica Minore del Sto Nino through a light sheet of rain was old and wistful. The stark-white adobe walls of the church slowly turned into a sad gray as the rain drizzled steadily around them. Other than that, the church looked the same as he remembered from Sundays when he was kid or on that odd Sinulog novena his lola used to take him to. On one side was the old church building straight out of the Spanish era. In front of it sprawled the courtyard flanked by bleachers on two sides. Then the grand altar at the end of the courtyard. Except for the crowds, it was the Sto Nino he grew up in. Today there were some people milling about--- the rain wasn’t that bad yet, after all--- some Korean tourists were taking photos of the candle vendors and the candle vendors, they offered prayers and dances in return. He doesn’t usually seek divine intervention in most cases, but the licensure exams the day after tomorrow--- well, that wasn’t most cases. The coins he dropped clanged against the bottom of the metal box. His hands felt weird from all the wax-- it was both sticky and slippery at the same time--- but at last, 10 little red candles were on his hands, ready to be offered up to the heavens. Here we go, he thinks, as he lights up the candles one by one. The flames warm and illuminate his face, and it was a nice little comfort in this weather. One candle for good health for him and his family. Two for passing the exams. Please Sto Nino--- let me pass this please. The idea of failing sent a cold tingle up his spine. It wasn’t just acceptable. So many were counting on him to make it. After a moment of silence, he paused at lighting the remaining candles, thinking of what else to pray for. Money? Time? He has both and in comfortable amounts. How about some closure? A tiny voice in his head said, You sure could use some closure. Seven candles wouldn’t be too desperate, either. He could only smirk, bitter and biting all at once. Does Sto Nino even listen to cheating guys? He’d like to think the child Jesus was impartial to cheaters and loyal boys alike. He’d started of as one of the good ones, didn’t he? So, seven candles. For forgiveness. For closure. For the guilt in his chest to ease. For making amends to what he’s done. To salvage what they had? Maybe, but if that doesn’t come then a prayer for forgetting her swiftly was the next best thing he could hope for. Because time didn’t make it any easier, not really. In all the ways that mattered, in all the ways he never thought he could--- he missed her. And it caught him unawares each time. Tears started to prick behind his eyes just as someone called his name. Like the breath left out of her too. When he tried to say her name, it came out hoarse and trembling. She smiled--- smiled--- wanly and held up the candles very much like the ones he just lit. She just shrugged as if she’d been caught red-handed. Something in his chest eased a bit. Basilica Minore del Sto Nino through a light sheet of rain was old and wistful. He didn’t ask for divine intervention much but seeing the soft look in her eyes and the quiet, tentative way she called his name--- he’s thinking maybe those little candles did work. Because he’s been given a little miracle, whether he deserved it or not. Hi friends! If you are still here, thank you for taking time out of your day to read some of the short stories I come up with! I appreciate it so, so much. 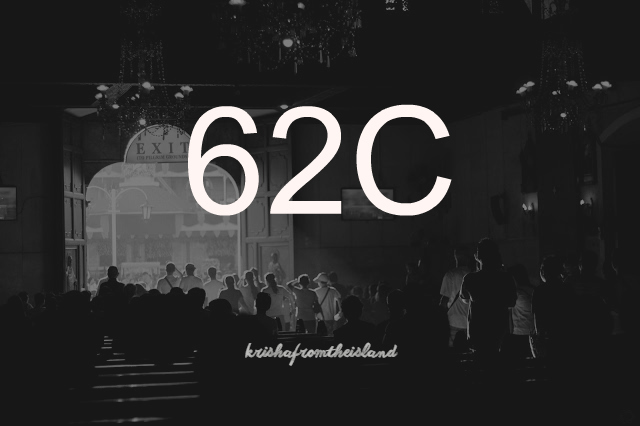 62C is a route that plies most of downtown all the way to Talamban, the northeasternish part of Cebu. I hope you enjoyed reading this as much as I enjoyed writing it! As always your comments, suggestions, violent reactions and random food offerings are very, very welcome and appreciated. Please let me know what you think of this one and our fiction series as a whole thus far!